"I want to apologize to Reeva's family, to those of you who knew her and are here today. There is not a moment and there hasn't been a moment since this tragedy happened that I haven't thought about your family. "I wake up in the morning and you're the first people I think of, the first people I pray for. I can promise that when she went to bed that night she felt loved. "I've tried to put my words on paper many times to write to you but no words would ever suffice." Pistorius shot and killed his live-in girlfriend on Feb. 14 of last year, and his defense has always been that he mistook her for an intruder. Today's testimony was largely Pistorius recounting the formative events of his life, in what a cynic might see as a plea for sympathy—his disability, the unexpected death of his mother, a 2009 boating accident that briefly put him in a coma and left him "withdrawn" and "fearful." But the day's most emotional moments came as Pistorius described his life since Steenkamp's killing. In a quavering voice (the judge had to ask him to speak up on multiple occasions), Pistorius said he's been battling nightmares over the last year. "I'm scared to sleep. I have terrible nightmares about things that happened that night. I can smell blood. I wake up to being terrified. "I wake up in a complete state of terror to the point that I would rather not sleep." 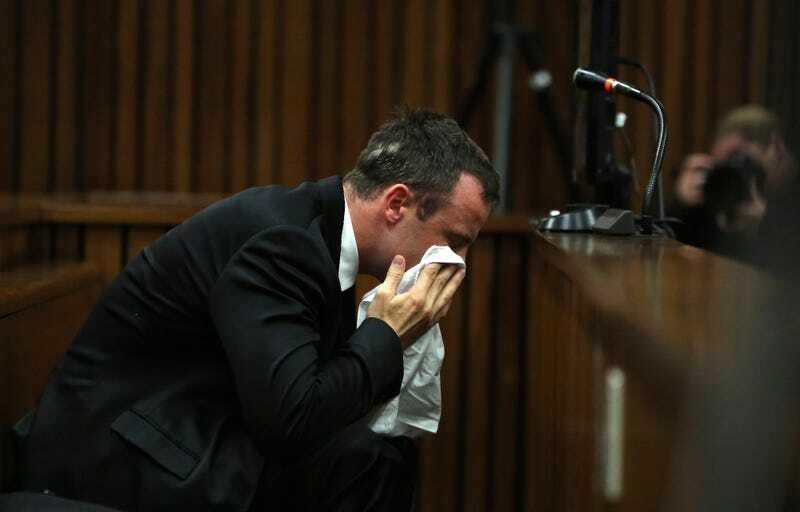 Earlier in the day, Pistorius broke down repeatedly as he listened to a pathologist testify about the crime scene. He cried into a towel, and on multiple instances, retched into a bucket at his feet. Noting that Pistorius did not sleep at all last night, his lawyer asked the judge for an early end to the day's proceedings. Pistorius will be back on the stand tomorrow morning, and when his testimony is done, he will be cross examined by the prosecution.